In a Nutshell: From finding the right college to finding a way to pay for it, the college admissions process is often a giant headache. Every year, more than a million college-bound students (and their parents) use resources from The Princeton Review to help ease the pain. The website offers a variety of useful digital materials, including a database of thousands of popular colleges and articles offering great advice. Additionally, Princeton Review’s iconic publications are information treasure troves. The detailed annual editions include information that can help you find the best value college as well as step-by-step guides to navigating the financial aid process like an expert. Use the resources at The Princeton Review to demystify the admission process and become a confident college shopper. We live in a world populated by more than 7 billion people, so it should be little wonder that such a wide variety of fears and phobias exist. Really, if there is a noun, verb, or even adjective that exists, odds are there also exists someone who is afraid of it. Even some things that many would consider completely innocuous have associated phobias. You may be thinking of participating in “No-Shave November,” but if your spouse has pogonophobia — the fear of beards — you may have to think again. And the next time you sport a two-piece swimsuit, consider the feelings of those who have omphalophobia (the fear of navels). Of course, not everything we fear is a designated phobia; some of the most anxiety-provoking ordeals we go through are simply regular parts of life. For example, many students and parents probably believe that there should be a spot on the list of phobias for applying to college — and paying for it. Rob Franek is Editor-in-Chief for the Princeton Review. Just about every part of the college admission process can be fraught with stress and anxiety, from the necessary tests, such as the SAT and ACT, to the pile of college and financial applications that must be filled out. In fact, the annual Princeton Review survey of students and parents applying for college revealed the toughest parts of the admissions process are taking exams and completing applications. If anyone knows about creating confidence in the college-bound, it’s The Princeton Review. 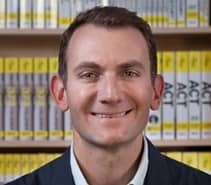 The company has been helping students prepare for college since 1981 when founder John Katzman used computer analysis of test performance to develop an SAT preparation system for 15 college-bound students in New York City. John’s initial course — which he called “The Princeton Review” — evolved into a popular book, Cracking the SAT, and was the beginning of what would become today’s Princeton Review, a company synonymous with college preparation. For the last 35 years, Princeton Review has been the one-stop shop for all things exams. They create confident test-takers with in-depth preparation guides, courses, and even private tutoring, covering just about every test, including SAT, ACT, AP, GRE, GMAT, LSAT, MCAT, ISEE, TOEFL — just to name a few. The Princeton Review offers a variety of resources to help students with college admissions, including test preparation materials and step-by-step financial aid guides. “The truth is that these tests are absolutely navigable and absolutely masterable,” Rob said. If your student needs extra help, you can find a private tutor for one-on-one guidance. Tutoring isn’t limited to the exams, either. The Princeton Review offers academic tutoring for multiple subject areas through its Homework Help service. Of course, Princeton Review is most known for their iconic publications; from their unique position in the world of education, The Princeton Review has been able to determine what students (and parents) need to know to successfully get through every part of the admission process. In particular, students and parents can learn a lot about picking the best value college and getting through the financial aid process, concepts that can be tricky to master without knowledgeable advice. Two popular Princeton Review titles, Colleges That Pay You Back and Paying for College Without Going Broke, help students and parents find the best-value schools — and learn how to pay for them. Ranging from detailed college profiles designed to help you find the best value, to step-by-step guides to help students and parents navigate the financial aid process, each book is packed with information. 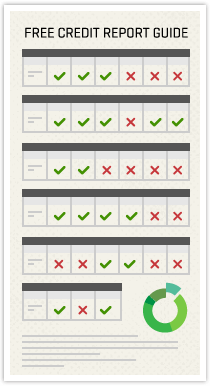 In fact, so much goes into an annual Princeton Review publication that they’re working almost year-round to make it happen. As with many aspects of life, having the right information when you begin the college admissions process can help prevent a lot of stress and anxiety down the line. In particular, being knowledgeable about the financial aid process will help save you from the eventual headaches as well as helping to save you money. 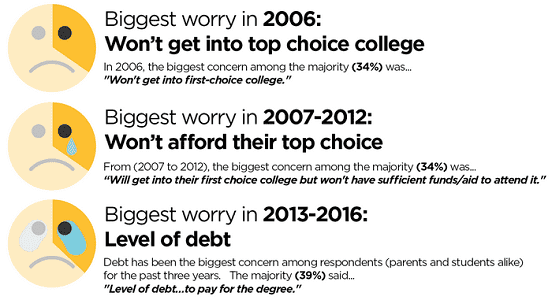 “People, no matter their socioeconomic group, are scared to talk about paying for college,” explained Rob. “It’s just a scary subject, regardless of where you are on the financial spectrum.” Fears of how they’re going to make costly tuition payments aren’t just limited to parents; it weighs heavily on the minds of most prospective students, too. An annual Princeton Review survey showed the biggest fear of college-bound students is the amount of debt they’ll take on for college. For many, the search for the best college usually starts the same way as the search for the best pair of jeans: with the brand. In the modern market, though, Rob recommends that you forget the brand. Instead, he said, it’s all about how employable your potential school can make you. Rob said that admission teams, during prospective student presentations, should address career-oriented opportunities within the first 15 minutes of their introductory remarks. If not, the school may still operate on the old system, in which students don’t see the career services center until the second semester of their senior year. Even though it’s important to find a school that offers a good value, that doesn’t mean eliminating more expensive schools for price alone. According to Rob, one of the biggest mistakes students and parents both make is to draw conclusions about the affordability of a big price tag school. By crossing that school off your list, however, you may be making a tragic mistake. A cushy financial aid package like the one at Rice can bring a pricey private college education down into the cost range of your typical public state college, which averaged around $19,000 this year. 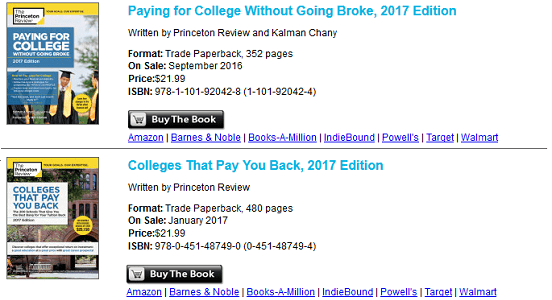 The Princeton Review’s book, Colleges That Pay You Back, is a great resource for finding the cost and average aid packages of hundreds of colleges around the country. The FAFSA, or Free Application for Federal Student Aid, is more than just your ticket to government funding. Many schools use your FAFSA information to grant their own in-house need-based scholarships. While you can always go to the Princeton Review website to get the latest information on the FAFSA (such as this change to the application window), the best way to gain FAFSA mastery is to pick up their full book, Paying for College Without Going Broke. S.A.T. : the three letters that can send a chill down the spine of almost any college-bound student. While there may be a number of schools that have test-optional admissions processes (they don’t require SAT or ACT scores), most schools will still use that exam data in other ways. That doesn’t mean you need to take every exam, of course. In most cases, unless your college application specifies one over the other, you can choose to take either the SAT or the ACT exam. How do you choose which to take? “Collegeadmissionsphobia” may not officially be in the medical books, but, for many students and parents, it may as well be. Thankfully, the resources at Princeton Review can help combat the fear and anxiety brought on by the hoards of tests, forms, and applications that make up the admissions process.